Jamie Cat Callan: He loves me, passionnément! 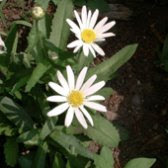 My French tutor, the beautiful Madame M, told me about the French version of picking daisy petals. You know, the way little girls will pluck the petals of a daisy to find out whether a boy "loves me or loves me not." Il m'aime pas du tout. He loves me a little. He loves me a lot. Ah, the French take on love. Even little girls know that romantic love is complicated and has many levels. Love is not black or white. It's so much more interesting than the American "He loves me, he loves me not." With the French, we have a little, a lot, passion, folly, and madness! Don't you just love that. I think my daughter learned it in grade school and taught it to me. So sweet, so French -- and like the French, rather realistic and romantic at the same time. Yes, that's it exactly--romantic and realistic! Thanks for the comment, Tish! I thoroughly enjoyed this post! Really great. True and very French!